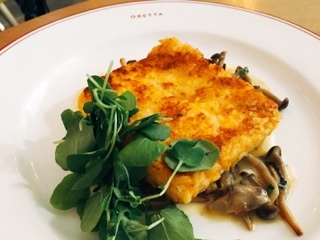 A scroll through Oretta’s Instagram tags and you’ll see it’s a beautiful restaurant with a lavish dining room. Sure, it’s gorgeous, but there’s also something eerily familiar about it. 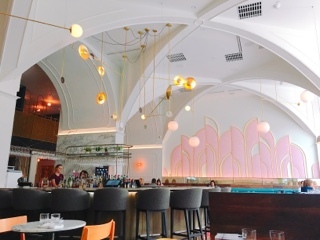 Looking around, there’s the airy high ceilings and blush pink colour scheme of Figo, the art deco brass accents from La Banane, and in the centre of the room, a huge round bar that also sits in Lena. 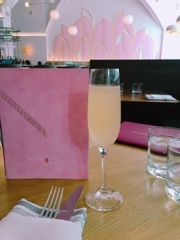 Indeed, there’s nothing wrong with having elements similar to other restaurants, but the sense of déjà vu kept sneaking in as I sipped on the tasty a la nonna ($13), a spiced pear puree and Prosecco cocktail, that could replace a mimosa any day. As I thought about the meal, I couldn’t help but see how the experience followed the popular “hamburger method” of providing feedback – start positive, give the hard meaty truth, then end positive. 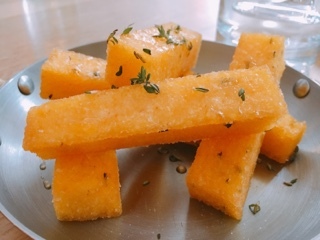 To begin, the fried parsnip polenta ($5) was fantastic with the ultra-crispy golden crust, creamy interior, and sprinkles of thyme and honey. A small slip may be how the cook sprinkles on salt, likely after the sticks are intricately stacked, as I found the ones on the bottom didn’t have quite enough seasoning leaving the last bite not nearly as good as the first. Torontonians are spoiled with the quality of Italian establishments in the city. All the sudden, serving freshly made pasta is just table stakes for most restaurants. 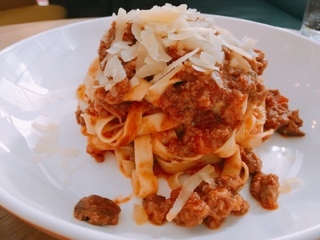 Oretta’s tagliatelle ($19) arrives as a large mound of pasta tossed in Nonna Lea’s ragu and a generous sprinkling of parmigiano. All in all, it’s a pasta Nonna Lea can likely stand behind, the red sauce was really hearty and meaty. If only there was more of the tasty ragu, as I did find it a tad sticky and difficult to untangle the long strands of pasta. In lieu of the traditional creamy liquid rice dish, the risotto al salto ($22) pan fries a squash risotto pancake to create crispy exterior. With plenty of castelmagno fonduta incorporated into the rice, the dish is fairly cheesy, so it almost tastes like deep fried mac ‘n’ cheese balls with a creamy plump mushroom sauce over top. Overall, it’s a good dish, but works better as a shared appetizer. As a main, it’s a bit heavy and not quite satisfying on its own. 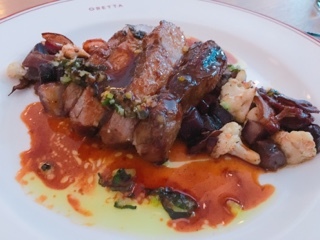 From the moment the spalla d'agnello ($28) arrived I knew the lamb shoulder was overcooked … looking like slices of thick pork chop, there wasn’t an ounce of fat, let alone pinkness in the meat. One bite into the lamb confirmed my suspicions, it was tough and the well seared crust so hard it was scratchy on the way down. Even the medley of creamy baby potato pieces, salty lamb bacon, and crunchy cauliflower didn’t help. Sure, these would have been good as a side, but not nearly saucy enough to save the terribly dry lamb. Thankfully, the chef’s selection of sweets in the assaggi dolci ($16) saved the meal from a dreadful ending. 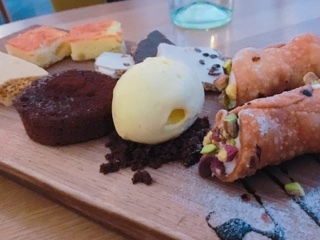 It included the freshest cannoli I’ve ever tasted - the shell presumably freshly fried as it was still extremely crispy and distinct from the creamy ricotta filling. Even the pistachios were left in larger chunks, so there was an intense crunchiness to the cannoli, which finished much too quickly. Make sure you dig into the rich dark chocolate cake while it’s still hot and gives off a lovely cocoa aroma. Although the ice cold vanilla gelato would pair with the cake, it’s equally enjoyable on its own since it arrives on a bed of chocolate cookie crumbs, which when mixed into the ice cream gave it a lovely cookies and cream taste. What a great selection of desserts including wonderfully thin and nutty peanut brittle dipped in dark and white chocolate, sweet stick-to-your-teeth honeycomb candy (the honey toffee inside a Crunchie bar), and moist squares of almond cake. All in all, another decent, but not excellent Italian restaurant has joined the fold. My parting thoughts of the restaurant: a pretty but dry hamburger.